VICTORIA STATION, BOMBAY, provides a striking contrast to its namesake in London. THE Indian railways, one of the largest single commercial enterprises in the world, operate more than 42,000 miles of track. They consist of fourteen first, sixteen second, and twenty-eight third-class railway systems, primarily controlled and directed by one Railway Board. The organization is the result of the activities of 150 different enterprises which built railways either with the aid of British capital, or with funds from the Government, or else with the money of Indian princes. What was not conceived as an organic whole has now become so co-ordinated that the existing railway systems work as individual parts in one great unit. Seven of the big railways (called “first-class” railways because their gross earnings are over £300,000 a year) are now the property of the State, while the other seven, although managed by private companies either for the sake of convenience or on account of agreements with the Government, are to all intents part of the State system, deriving as they do their finance from the Government. Of the second- and third-class railways, some depend upon the State for funds, while others are run by private companies or by the governments of native states; their importance is very small and their voice in the parliament of Indian railways is proportionately insignificant. The organization of the transport system falls upon the shoulders of a small body of men at Delhi, the Railway Board, who are responsible for the finance, policy, and direction of all railways which are members of the Indian Railways Conference Association. At the same time each railway has its “agent” or general manager. On the State-owned railways he is responsible only to the Railway Board; on privately managed railways he is responsible primarily to a board of directors, which usually meets in England, and secondly to the Railway Board. By this means wasteful competition has been eliminated, fares and freight rates have been standardized, conditions of service and scales of pay have been stabilized, and improvements in engineering and mechanical technique have been effected. India now has a railway system which compares favourably with those in Europe and America. It is difficult for anyone who has not been to India to realize how formidable were the problems which faced and still confront railway administrations. There is the size of the sub-continent; there is the climate, ranging from the steaming heat of the tropical south to the scorching sun or penetrating cold of the north; there are the difficulties of mountain ranges, waterless deserts, tropical jungles, malarial swamps cut up by great rivers; and there is, finally, an enormous population of over 350 millions, mostly agriculturist and poor, speaking a conglomeration of languages, worshipping a medley of different gods, and observing as many different customs as there are minutes in the day. It cannot be wondered at, then, that Indian travel presents peculiarities and marvels to the visitor such as he is not likely to find elsewhere. The traveller probably will not realize, until he is one day bundled out of his large compartment into one of about half the size at some unearthly hour of the night, that the Indian railways are built in three different gauges - broad, metre, and narrow. On a broad-gauge line he will find trains having much larger carriages than those to which he is accustomed in Great Britain; but when he enters a metre-gauge train he discovers that the difference between 5 ft 6-in and 3 ft 3⅜-in is very considerable; while, if he is so unlucky as to be compelled to travel by narrow gauge, he will imagine that he is riding in a box on wheels as he bowls along on rails 2 ft 6-in apart. The inconvenience and the expense involved by these changes of gauge are as irritating to the railway administration as they are to the traveller, but they are, under present conditions, inevitable, since they result from the cost of building rail-ways in India. So much of the country is difficult and sparsely populated that there is no financial justification, if the railway is to be a profit-making concern, in building the expensive equipment which a broad-gauge railway involves. As a rule, the densely populated districts, which are usually the most fertile, are served by the broad-gauge railways - strategic railways are also built to this gauge - while the more scattered populations are served by either metre- or narrow-gauge lines. These two are adopted principally for the railways which serve the hill stations of the Himalayas or the ranges of Southern India and Assam. The North-Western, East Indian, Great Indian Peninsula and Bengal-Nagpur lines, with the main lines of the Madras and Southern Mahratta and the Bombay, Baroda and Central India Railways, form the main arteries connecting the great ports with the industrial and agricultural centres of India, and are broad gauge. The railways of Rajputana, Central and South India, Burma, and Assam, as well as those operating between the Ganges and the Himalayas, are chiefly metre gauge. The Indian railways have three classes - first, second, and third. The first class is used principally by Europeans, wealthy Indian merchants, and Government officials; the rate charged is about 1½d per mile. The second class is used mostly by Indians of the better class and Europeans, while the third class is used almost entirely by the Indian peasants. The rate for the second class is about ½d and for the third class less than ¼d per mile. As far as passenger traffic is concerned the third class is the only one that shows any likelihood of producing a profitable return. It is with first-class travel that visitors from Europe are mostly concerned. Such a passenger will occupy a compartment which is about 12 ft long and 8 ft wide, with accommodation for six persons by day and four by night. He will find two sofas running lengthwise, surmounted by two upper berths, which are let down at night for sleeping purposes. Each compartment will have a lavatory and bathroom, two or more electric fans, adequate lighting, including bed lamps, probably two arm-chairs, a small collapsible table and a chest of drawers; there will be six window frames each having a pane of glass, a mesh of fine gauze wire as a protection against dirt and dust, and wooden shutters to exclude the glare of the sun. The traveller has to provide bedding, and will probably be accompanied by a native servant who travels in a special compartment at the end of the carriage. As there is no corridor on most Indian mail trains, the passenger can only make his way to and from the restaurant car for meals at stations where the train stops; when there is no restaurant car attached to the train, the passenger takes his meals in the station refreshment room, and a sufficiently long halt is allowed for this at the station. Visitors to India frequently object to the non-corridor system on long-distance trains; but in practice, having regard to comfort, to privacy and to the safety of persons and property, the system suits the travelling public. In some ways first-class travel in India is more comfortable than in the more confined spaces allotted to the passenger in Europe. There are, however, two things that militate against comfort. These are heat and dust, over neither of which, unfortunately, have the railway authorities any control. ACROSS THE FLOOD WATERS of the Mahi River can be seen the railway bridge of the Bombay, Baroda and Central Railway, with its eight 220-ft spans. 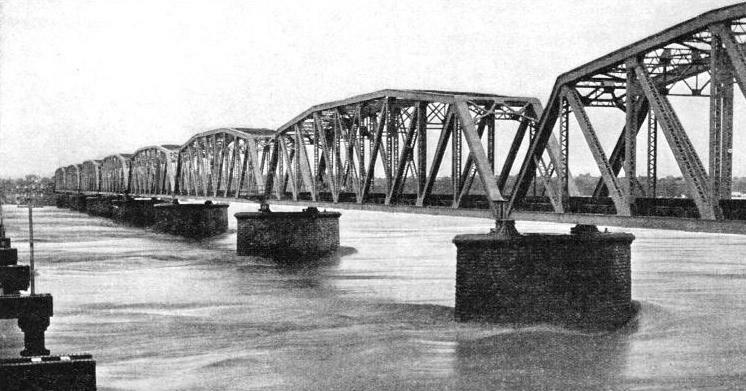 The bridge was opened in 1913. The old bridge can be seen on the extreme left. In the dry season the tops of the girders are 100 ft above the dry river bed. Except in the three or four winter months the day is hot and uncomfortable, while at the height of the hot weather the temperature, day and night, is so great that only those who cannot avoid doing so travel. Electric fans are of little avail when the thermometer is between 110 degrees and 120 degrees; in fact, they do nothing but blow hot streams of air upon the already overheated body. It is, however, possible to buy large blocks of ice which are placed in containers on the floor of the compartment, which do something to bring the temperature down to more normal proportions. In the old days it used to be common to have Kus-Kus-Tatties fixed outside the windows in the hot weather. These were frames made of coco-nut matting which were kept damp, so that the air blowing through the wet matting arrived moderately cool in the compartment. But that was before electric fans, and the frames were never wholly satisfactory. Then there is dust. A fortune awaits the person who can invent an economical dust-proof window for Indian railways. Except during the monsoon the approach of an Indian train can be seen miles away by its attendant pillar of dust. There is always the problem of keeping some of the dust out of a compartment and also all the air, by closing all the windows, or letting air in with its inevitable dust. Whichever alternative one chooses there is the certainty that there will still be dust everywhere in the compartment and over oneself. To keep even comparatively clean is a difficult problem. But there are compensations. The railway stations offer a kaleidoscope of Indian life. Looking at a station at train time one would imagine that the whole of India’s vast population was for ever on the move. The third-class carriages, having a holding capacity of about 120 people on the broad gauge, always seem to be full. Hours before a train is due the station platform will be cluttered up with recumbent forms, some of whom have spent the night sleeping on the ground. When the train arrives, seemingly inanimate objects burst into hurrying or screaming life, and there is seen such a jostling and pushing as would make one think that they were all fleeing from some frightful and pursuing enemy. Carriages, which already seem to be overflowing, absorb another dozen or so without any apparent difficulty. Sellers of sweets, fruit, and tea mingle with beggars and passengers to create still further pandemonium. Purdah ladies, closely guarded and covered, so that they resemble moving bathing tents, are pushed through the crowds to the special compartments reserved for women only; holy men, pseudo or otherwise, scantily clad in torn clothes, smeared with ashes and inevitably without tickets, are dragged by perspiring ticket collectors from carriages and pushed out of the station gates. Then the whistle blows and, as if by magic, the entangled mass of humanity sorts itself out, everyone is aboard and seated and, sad to relate, some ten or more per cent of those crushed together in the third-class carriages have bought no tickets. A PICTURESQUE SCENE on the Kalka-Simla Railway. The train is emerging from the Barogh Tunnel, which is nearly one mile in length. This disease of travelling without tickets is one of the most serious which affect Indian railways. When it is considered that two or three million culprits are detected every year, it is a matter for speculation as to how many escape. The cost of the measures which have to be adopted for detection is so great that it is often a matter for consideration whether it would not be better to let well alone. It also leads on to a further speculation as to why the Indian poorer class, which, of course, is the great bulk of the population, travels at all. Although the third-class fare is, by European standards, ridiculously low, any journey for the Indian peasant is a very serious financial undertaking. He can rarely travel for pleasure, since his life is one long struggle to earn a pittance. He is, however, very often obliged to make a journey owing to his religion, his social customs, or his inevitable and unending entanglement in litigation. Such peculiarities of Indian travel do not give any indication of the problems which had to be overcome to make Indian rail-way travel smooth and uneventful. From an engineering point of view the country presented peculiar difficulties. Supposing one took the journey from Bombay to Peshawar on the Bombay, Baroda and Central India or the North-Western Railway as an example. One would leave Bombay in a tropical climate where, among other things, the damp heat gives the wood-work of rolling-stock a tendency to swell; in forty-eight hours, if it were winter, one would be in the almost arctic conditions of the North-West Frontier Province. Leaving Bombay, one travels for 350 miles over the flat plain that lies between the Western Ghats and the sea; there are five major rivers to be spanned, two of which require bridges of over three-quarters of a mile in length, bridges the found-ations of which are continually subjected to the seasonal rush of swollen waters. The track then mounts the Western Ghats, climbing to over 2,000 ft above sea-level in a distance of about sixty miles; thence on for another 500 miles of arid country, where water is almost always scarce and inevitably bad, where whole railway colonies have had to be built in the “blue” and equipped with all the amenities of domestic and social life; thence from Delhi over the wide, sandy, yet fertile plains of the Punjab, rising at last into the barren foothills of the Hindu Kush. 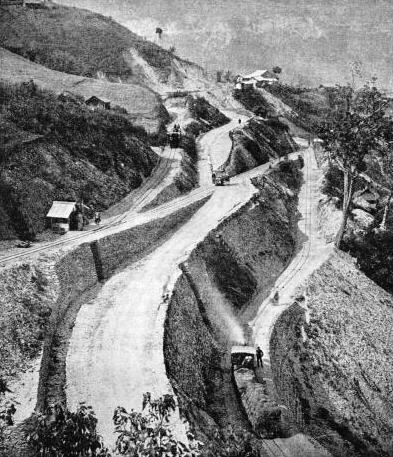 EXTREME GRADIENTS on the Darjeeling-Himalayan Railway have demanded special engineering measures. The picture shows a typical reversing station on a steep incline. The gauge is only 2 ft. The coal for this train will have come some 1,500 miles from the mines in Bengal, the water for the engine has had to be pumped from deep wells or brought from a nearby river; the steel for the rails has been brought from the Tatanagar Mills in Bengal; the locomotive has been manufactured, most likely, in England and shipped whole to India; the rolling-stock has probably been made abroad and erected in the railway carriage shops in Bombay; there will have been about eight changes of engine; and one will have lived in the same compartment for two days and two nights. In other parts of India there are different problems. In the deserts of Rajputana and Sind, for example, the permanent way has been laid direct upon the sand with little or no ballast. Its stability is consequently such that very fast speeds are dangerous, while at any moment during the monsoon period a sudden rainstorm may wash away great lengths of line and stop all traffic. In these districts a swarm of locusts has been known to dislocate the train service by rendering the rails so slippery with their crushed bodies that the wheels could not grip sufficiently. 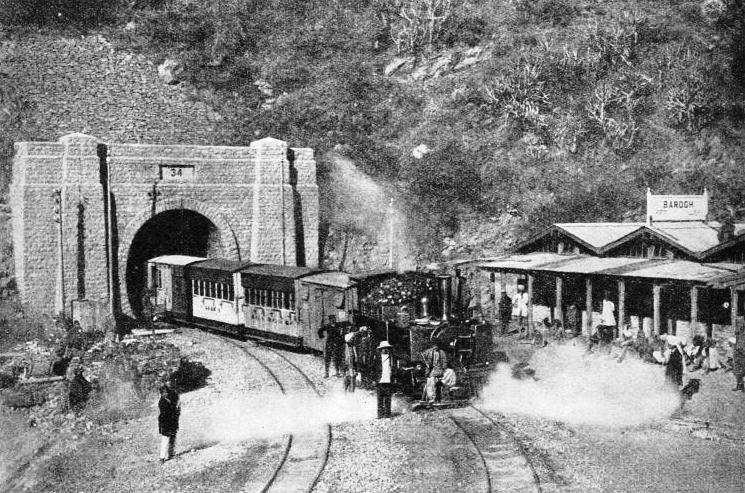 The short mountain railways give other examples of difficulties overcome. The three most famous of these railways are the Kalka-Simla, operated by the North Western Railway, the Nilgiri, operated by the South Indian Railway, and the Darjeeling-Himalayan Railway; the first is narrow gauge, the second is metre gauge and the last is a special 2-ft gauge. In these instances the main lines terminate in the low foothills and then a mountain railway carries goods and passengers, the Simla Railway for fifty-nine miles, the Darjeeling Railway for fifty-one miles and the Nilgiri Railway for twenty-eight miles, to elevations varying from about 5,000 ft to approximately 7,500 ft above sea-level. This journey is accomplished over grad-ients of from 1 in 33 to 1 in 22½; so sharp are many of the curves that it is almost possible for the engine driver to exchange handshakes with the guard of his train. On the Kalka-Simla line which, as Simla is the summer quarters of the Indian Government, is the most important of the three, motor coaches running on the railway tracks have for some time supplemented the train service. These coaches have accomplished the journey in the relatively fast time of about three hours. A POWERFUL LOCOMOTIVE of the 4-6-2 type used on the broad-gauge system of the Eastern Bengal State Railway. 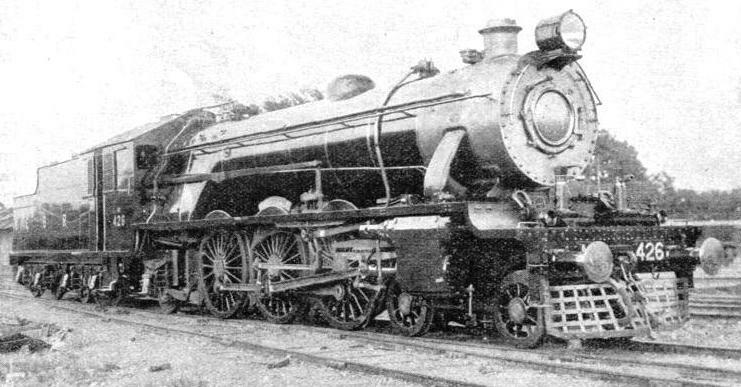 This XB class engine was named “Lord Irwin”, after the ex-Viceroy. In spite of the many constructional and operating difficulties which face the Indian railways, express services of the major systems are good. Care such as that given to the maintenance of the permanent way in Great Britain is not possible in India. On most railways ruling gradients are steeper and the track is very largely unfenced, except in built-up areas, so that speed is restricted compared with Great Britain. Long stretches of line have a maximum permitted speed of only forty-five miles an hour, and it is only in certain selected areas that from fifty to sixty miles an hour is possible. Expresses in England and France seem to gather strength at the approach to a station, crash over the facing points and hurl themselves through some busy junction; but the approach of an Indian express to a station is very different, speed being limited often to thirty miles an hour. But in spite of these restrictions the mail trains of the various railways manage to complete their journeys in good time. 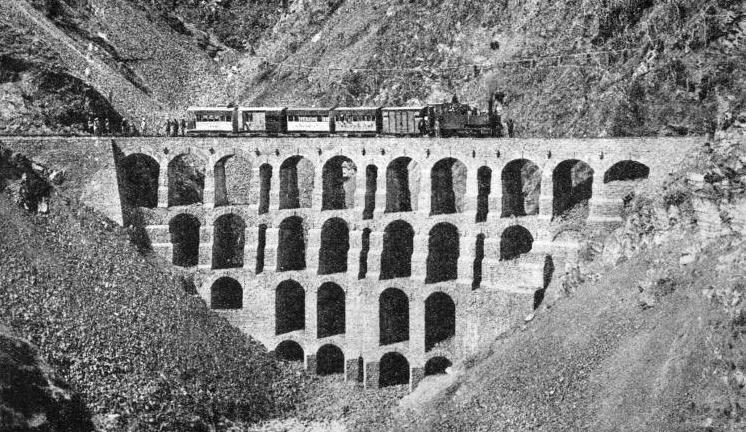 A GALLERY-LIKE VIADUCT on the Kalka-Simla mountain railway. This narrow-gauge line of 2 ft 8-in is operated by the North-Western, the largest system in India. Most mail trains are long-distance trains, as the focal points of India are usually many miles apart. They run chiefly from the great ports of Bombay, Madras, Calcutta, and Karachi to Delhi, the North-West Frontier, and the industrial cities; and, because Bombay and Calcutta are by a long way the most important commercial centres, it is only natural to suppose that the crack train would run between these two places. This is the famous “Blue Train”, not famous on account of its speed, but because it is specially equipped to carry first and second-class passengers only, and to connect once a week with the inward and outward mail steamers at Bombay which carry the mails to and from England. The “Blue Train” is the only long-distance corridor express in the country, and resembles the trains of Europe. It is a luxury train which is saved from the rough use which is the lot of the ordinary daily mail trains. Among this class there are two which hold the pride of place : the “Frontier Mail” of the Bombay, Baroda and Central India and the North-Western railways, which connects Bombay with Delhi, or the North-West Frontier, and the East Indian Railway’s “Howrah”, a Punjab mail which links Calcutta with Delhi and the north. Both trains cover about 900 miles in about twenty-three hours. Such times may not appear good compared with those of short-distance expresses in England; but, when the distances are compared, and when account has been taken of the severities of the route, and of the many stops, which are unavoidable, for engine-changing, engine watering, and making connexions at junctions, the running time is found to be very creditable. BETWEEN BOMBAY AND DELHI. 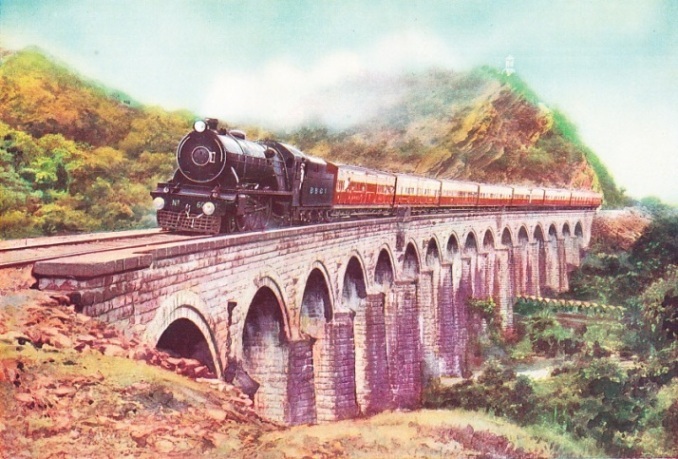 A striking view of the Frontier Mail passing over a viaduct on the Darah section of the Bombay Baroda & Central India Railway. Leaving Delhi, the mail train proceeds on the lines of the North Western Railway to the north-western frontier town of Peshawar. The locomotive, one of the biggest in India, is of the XC 4-6-2 type. It weighs 175 tons and has a tractive effort of 30,625 lb. Possibly the most romantic of India’s mail trains is the “Grand Trunk Express”, which links the sub-continent from south to north. It is the longest through train in the country, and one which presents to the traveller what might be called a panoramic view of the scenery and peoples. Starting from the Coromandel coast at Dhanushkodi in the south, it takes one through the rice fields of Madras, through the cotton-growing plateau of the Deccan and the jungles of Central India, through the land of the Moguls to Delhi, and thence on through the land of the five rivers, which is Punjab, to Peshawar, the gateway of the north and the outlet to strange lands beyond the mountains. One short-distance train, operated by the Great Indian Peninsula Railway, runs from Bombay to Poona with a timing of two hours forty minutes, for a journey of 120 miles. The performance of the “Deccan Queen” is more remarkable when it is realized that during the journey the steep face of the Western Ghats, the mountain range that cuts the plateau of the Deccan off from the Indian Ocean, has to be surmounted. 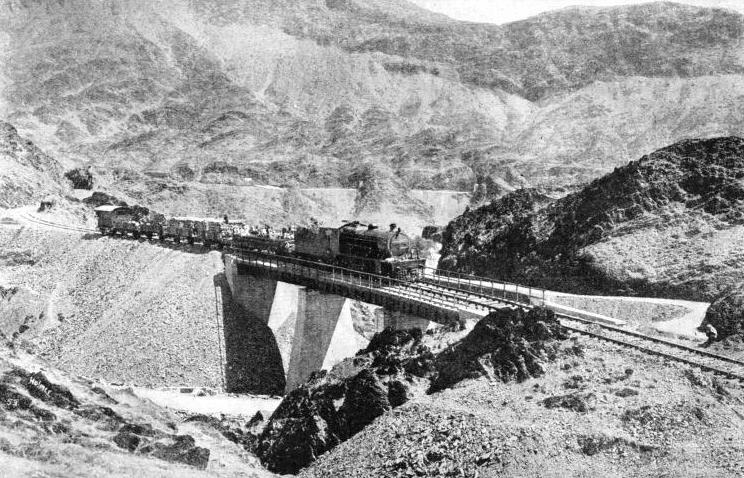 In about fifteen miles the train climbs to over 2,500 ft above sea-level, negotiating gradients as formidable as 1 in 37, where, were speed possible, it is prohibited. For the rest of the journey, the “Deccan Queen” maintains a speed of about sixty miles an hour. This train is corridor throughout, and is, more important still, the first and fastest electric train in India. IN THE FAMOUS KHYBER PASS. A local train is crossing a bridge not far from Shahgai, on the Khyber Railway. This picture clearly shows the difficult country through which the Khyber Railway has to pass. In recent years the electrification of certain sections of the Indian railways, chiefly around Bombay, has made rapid progress. The need of electric train services became evident first in Bombay. Owing to the configuration of the city, it became no longer possible to carry the heavy daily passenger traffic by the steam train services. Bombay is built upon an island, or rather what were originally seven separate islands; its development, which has been very rapid during the last three decades, has been to the north into the island of Salsette, where suburbs reach up to thirty miles from the heart of the city. This growing suburban population is served by the Bombay, Baroda and Central India and the Great Indian Peninsula railways. Up to twelve years ago the former railway had only one double line of track to carry both main line and local traffic into Bombay. It was found that even with quadruplication the maximum capacity of steam trains was insufficient. Both railways decided to instal an electrified local service, capable of running, at the peak periods, a five-minutes’ service. This work involved an interesting experiment in the transport of fully erected rolling-stock from England to India. Previously coaches built by British firms had been erected, inspected, and then dismantled for shipping in packing-cases - a procedure which took time and money. For the rolling-stock for the electrification of the Bombay suburban sections of the two railways it was decided to have the coaches erected in England and to ship them complete to India in a boat specially chartered. The excessive width of the vehicles, 12 ft, made it impossible to transport them by rail from Nottingham, where they had been built by Cammell Laird & Co, to Hull. A GOODS LOCOMOTIVE on HEH the Nizam’s State Railway. This 2-8-2 type engine weighs, in working order, 97½ tons, and has a total heating surface of 2,716 sq ft. Its cylinders are of 22½-in diameter with a 28-in stroke, while the total wheel base of engine and tender is 67 ft 4 in. They were transported by road on special bogies from the works to the Trent, where, from a wharf built for the purpose, they were transferred into flat-bottomed barges and by that means conveyed to Hull. Meanwhile, the coach bogies, fittings, and miscellaneous parts were packed in cases and sent by the same ship as deck cargo. At Bombay the bogies were unpacked and placed on the track at the quayside, and the coaches were then swung from the ship direct on to their bogies and were thence conveyed to the railway workshops to be made ready for service. The undertaking was carried out expeditiously and without a hitch. The electrification of the suburban sections of the two railways was completed between 1927 and 1928. Immediately afterwards the Great Indian Peninsula Railway decided to electrify its main line from Bombay to Poona, at that time one of the longest main line electrifications in the world, and later its line from Bombay to Igatpuri and beyond. While the Bombay, Baroda and Central India Railway takes its electrical power from the Tata Power Station, the Great Indian Peninsula Railway built a power station at Chola, some thirty miles from Bombay. These schemes, involving very heavy train services over the local sections, needed up-to-date electrically controlled signalling systems. In recent years the South Indian Railway has equipped the metre gauge line into Madras with an electrical service, and the new signalling has made a great difference. OVER 42,000 MILES OF TRACK are open to traffic in India. The network of the main systems can be seen in this map. The success of these new electrical services is remarkable when it is remembered that the railways had nowhere whence they could draw the staff required, either to drive or maintain the locomotives or to keep the technical equipment in repair. They had to start from zero and train an efficient organization. The Indian is proving himself a capable railwayman. In the past most of the engineering and transport officials were Europeans, recruited in Great Britain. The fore-men in the locomotive and engineering shops, the overseers on the permanent way, and the engine drivers were mostly men with British training or were drawn from the Anglo-Indian community who have made railway work almost their special prerogative. All this is changed. The recruitment of the upper subordinates from Great Britain has almost ceased, and, except when a man with special technical qualifications is required, positions of responsibility and trust are being filled by Indians. Of course, all unskilled manual labour has always been performed by Indians, who have found in railway work better pay and better conditions than in any other branch of industry. It has been compulsory for many railway companies to provide their transport staff with free living quarters, while quarters have also been built for workshop and other staffs for which a small rent is charged. 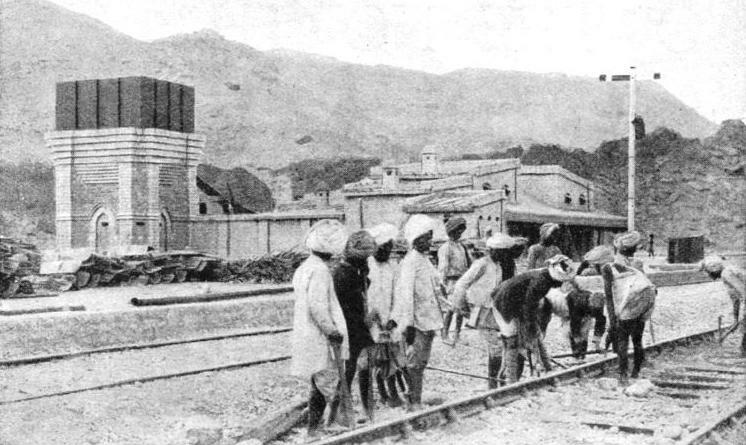 INDIAN LABOURERS AT WORK, renewing the ballast of the permanent way in a typical siding. India being the land of great rivers, there are great bridges which span the Ganges, the Indus, the Godavari, and many other rivers less well known but big enough to make the Thames at London look like an inconspicuous rivulet. Two great bridging works are now under way - the new three-quarters of a mile bridge over the Nerbudda at Broach and the remodelling of the magnificent Hardine Bridge over the Ganges, each of which will cost more than £1,000,000. The biggest locomotives on the broad-gauge railways are the XC 4-6-2 type passenger engine and the XD 2-8-2 goods engine, both of which are about 77 ft long and weigh about 175 tons, the former having a tractive effort of 30,625 lb and the latter a tractive effort of 35,260 lb. Although these locomotives do not compare with the monsters of America or Canada, they are rather larger than the big express and freight engines of Great Britain. Questions of stores, freight trains, transport problems, rescues from floods, adventures with the denizens of the jungle, all go to make up the comedies and tragedies and the ordinary humdrum life of the Indian railways. 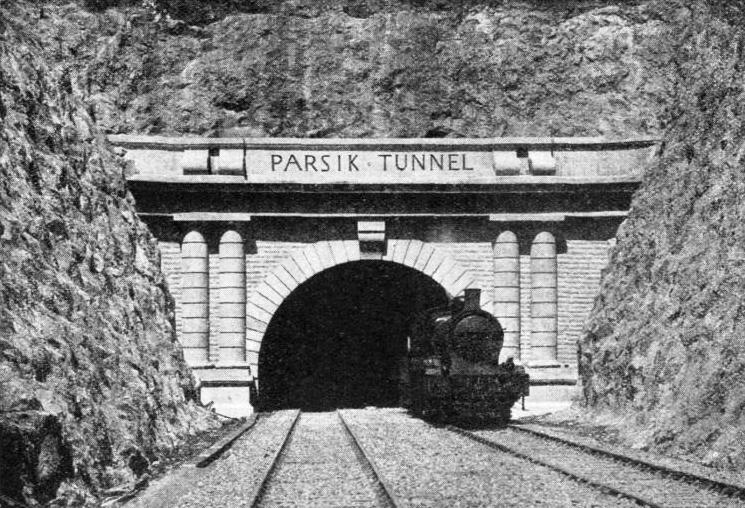 THE PARSIK TUNNEL on the Great Indian Peninsula Railway. This double-track tunnel was built in 1916, and is a splendid example of railway engineering in India. 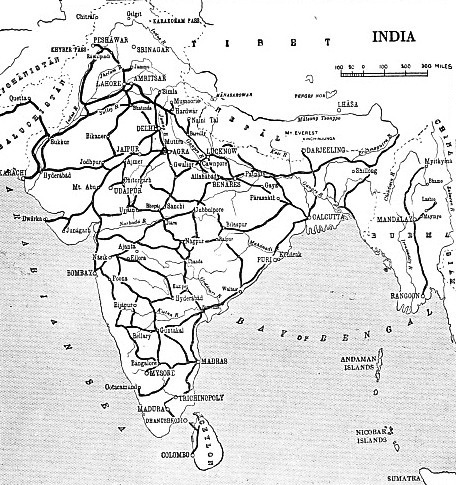 You can read more on “Electrification Overseas”, “A Himalayan Loop Line”, “Hill Lines of India” and “The Railway Invasion of India 1” on this website.